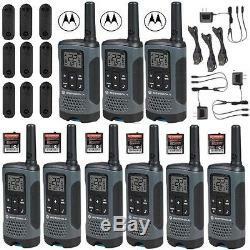 T200TP Gray Rechargeable 2-Way Radio Nine Pack. Thanks to its featherweight, compact design, the T200TP is comfortable to use. Use the scanning feature to see which channels are currently in use. Eco Smart feature allows it to consume less power during its idle condition. Communicate with other FRS/GMRS radios regardless of brand by being on the same channel and privacy code. Range: up to 20 miles. Number of Radios Included: 9. Battery Life: up to 12 hours on rechargeable pack or 29 hours with 3 AA batteries. Power Source: nickel metal-hydride rechargeable battery pack with micro USB charging or 3 AA batteries. Package Includes: 9 radios, 9 belt clips, 3 Y cable charging adapter with dual micro USB connectors, 3 charging adapter with a single micro USB connector, 3 AA nickel metal-hydride rechargeable battery packs, user's guide. The item "Motorola Talkabout T200TP Walkie Talkie 9 Pack Set 20 Mile Two Way Radio New" is in sale since Tuesday, June 27, 2017. This item is in the category "Consumer Electronics\Radio Communication\Walkie Talkies, Two-Way Radios".